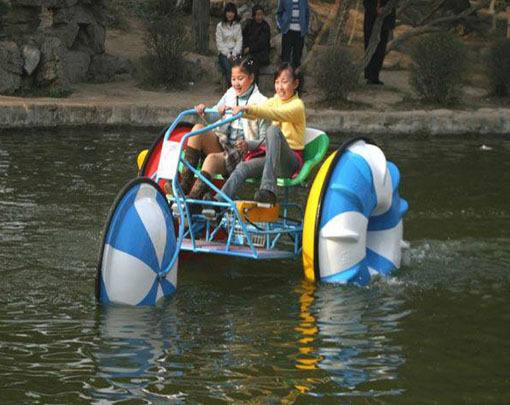 Water bike is a kind of human-powered boat who has a special shape that is different from the paddle boats for waters. It is also propelled by the action of the rider’s feet upon pedals of the whole equipment. 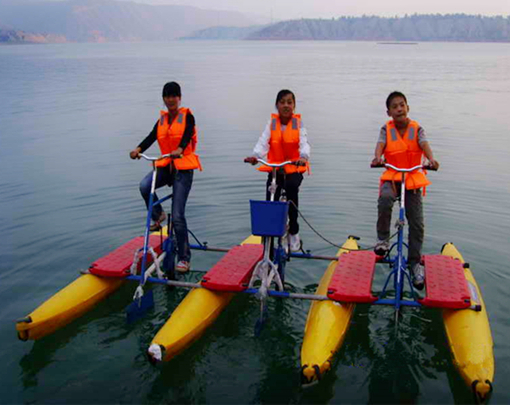 About its origin, we can say that water bikes begins at Canada, it is a kind of water sports for people at first, but now it has been evolved into a diversity activity for people. One is the water bicycles for sale, this means the bike that has 2 wheels in general, and one bicycle usually prepared for one person. 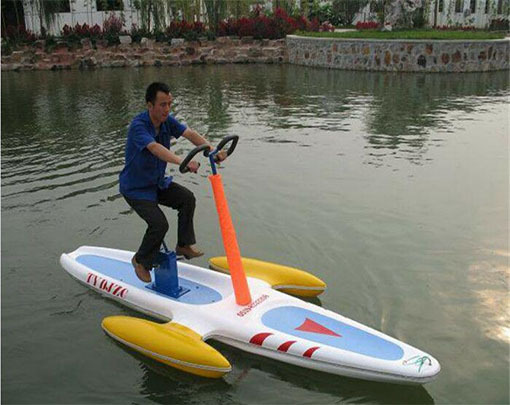 But manufacturers could produce the single water bicycles, double water bicycles or even trio water paddle bicycles for consumers. The other one is the water tricycles for sale: this means the bike has 3 wheels, and usually one tricycle could take 2 people in the same time, some of the tricycle will be equipped with a shed to prevent passengers from sunburn, because most of likes riding water paddle tricycles in summer. 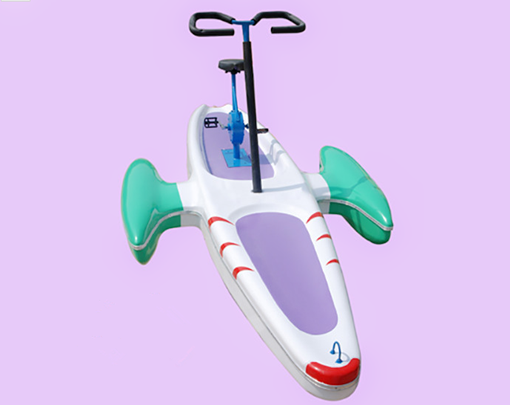 Height of the seat could be adjust and handlebar of the water bikes for sale are racing type which is easy to control, passengers could pedal it forward or backward freely or stay in the rider and float on the river leisurely. Water bike is easy to ride and with a high speed to 8-11 km/h, but you should not doubt its security, because it will never overtured, it is safe enough for people. 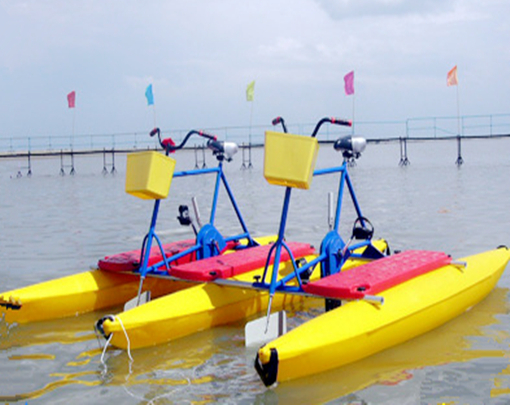 At the same time, these water bikes are suitable for all ages, this means kids, adults or even the old could have a relax with these amusement rides. 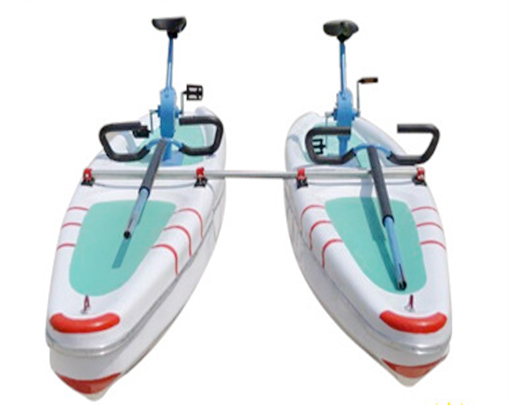 There are single and double water bikes, single water bikes refers to the bikes that prepared for only one person, but the double water bike rides is a combination between two single water bikes, when you need to buy water bikes for your water business, consider which model is perfect for you. Smooth: High performance polyethylene float makes the water bikes more stability than the traditional paddle boat and they could resist the waves. These water bikes could run in the 2 meters waves. Agile: Forwarding, backwarding or turning when riding the water bikes is agile. Chains and gears closely combine makes the driving efficiency higher. Normal speed of the water bikes is 8-12km/h which is a perfect entertainment tools for people. Rust and Corrosion: Gear box of the water bikes is sealed, all parts of the water bikes are treated by rust and corrosion. 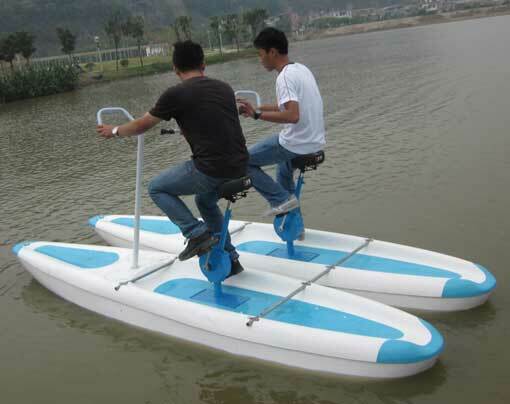 Then our water bikes could run in the sea and fresh water. Run in the Shallow Water: one foot is enough, and when propeller of the pedal water bikes hit the obstacle, it will lift to avoid. Material of the propeller is nylon which is durable than other materials. Travel Quiet: Foot propeller driving system is environmental, this will set aside a quiet living environment for the Aquatic. Light and Easy to Disassembly: Whole set of the water bike is light for people to carry and operate. People could install or disassembly it within several minutes. Convenient: Some of the water paddle bikes are equipped with car basket, water, food or other small staff could be filled in the basket. Long Life-span: Adopt the high density and corrosion-resistant polyethylene which will ensure a long life span for the equipment. Our best wholesale water bikes has exported to many areas and countries, such as Southeast Asia which include India, Malaysia (water bikes is popular in India, Malaysia and Thailand because of their climate), Southern Asia, Austria, Africa, North America which include Canada, Europe which include the UK, and so on. If people’s average weight is 80kg, two of the water board could provide greater buoyancy and handlebar is the conduct part, press it the front water board will upturned. And if people let it go, the equipment could reset by itself. With the temperature is going up, you will see more and more people in the water parks and riding on the water bikes, bumper boats or different kinds of paddle boats. 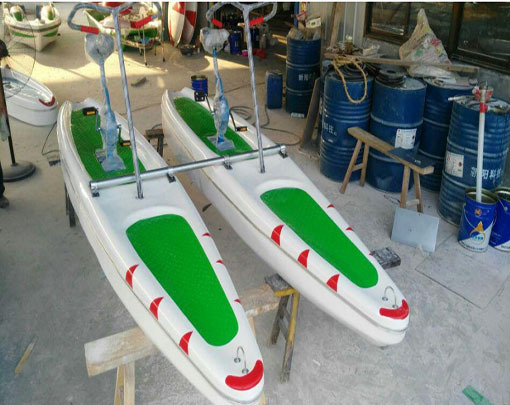 About the application of the water bikes, because of its light weight, it is suitable for most of the water activities, for example, amusement parks with ponds or swimming pools, large squares with water ground ponds or even the outdoor activities with some sets of quality inflatable swimming pools. 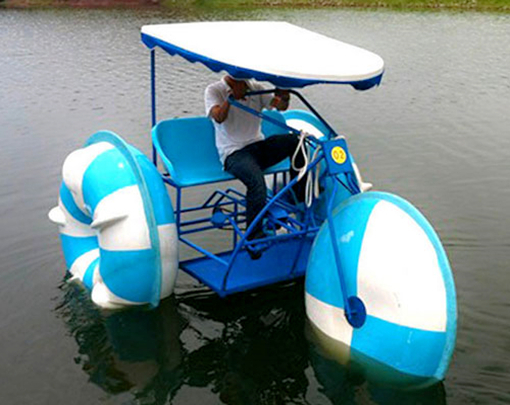 Above all, price of these water bikes are not high in our factory –Beston Paddle Boats.